One of the great things for a comic book fan is finding that weird, rare, unusual item from a favorite creator, a release so obscure one may not have even heard of it before. This happened to me recently when I was perusing the used magazine boxes at Amoeba Music in Hollywood recently. In between heavily worn early issues of Rolling Stone and dog-eared guitar tablature books I found a promotional comic from 1999 titled The Story of Buckethead. It contains a full 14 page story from the brilliant Dave McKean who also supplied the front and back cover art. 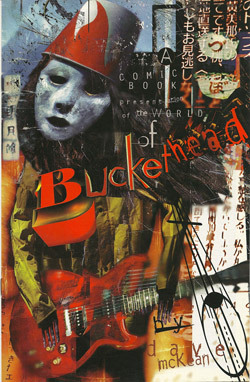 It’s story concerns the bizarre guitar virtuoso Buckethead, a musician (I must admit) I am most familiar with through his collaborations with performers such as Les Claypool, Viggo Mortensen, Bootsy Collins, and Guns n’ Roses. Known for his signature inverted Colonel Saunders bucket he wears on his head and blank white mask he uses to conceal his identity, Buckethead is a well known figure in musicians’ circles and amongst guitar aficionados. As it turns out, this type of mystery-shrouded musical personality is a natural match for a sequential art tale utilizing McKean’s exceptional mixed-media work. This particular comic is made all the more rare as it was reportedly created in 1995 to promote Buckethead’s first major label release Giant Robot. When the label pulled out on the albums release, the comic was shelved. In 1999 the book was distributed in limited quantities to promote the record Monsters and Robots. McKean not only designed the cover for this album, he also created a video for the track The Ballad of Buckethead, a song that also featured Les Claypool handling the vocal chores. The art direction of the video is immediately recognizable as McKean’s and foretells his future work in the medium, including his feature directorial debut Mirrormask. One last note regarding my finding of this oddity at Amoeba Music: my price for this book? One dollar. I love bin diving!